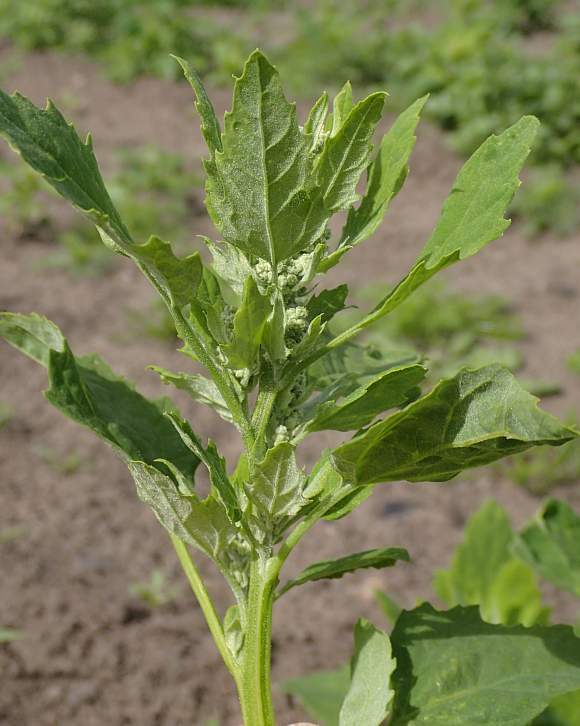 An erect plant to 1.5m found in arable fields as a relic, or on other disturbed ground. 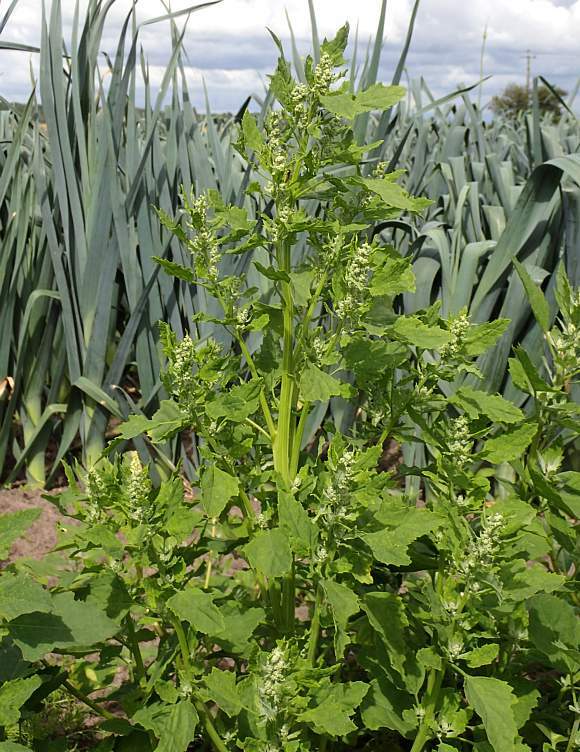 In the background the farmer is growing a variety of Leek, possibly 'Blue Solaise'. 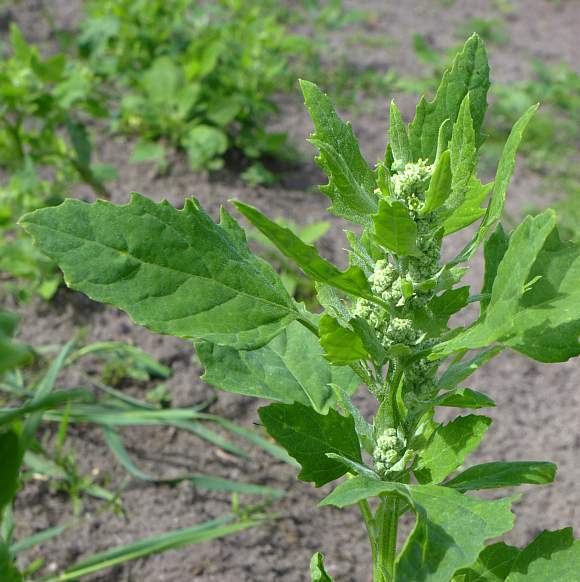 It is much the commonest Goosefoot and the most variable. Sometimes with purplish stems especially at leaf-junctions, but not these specimens. 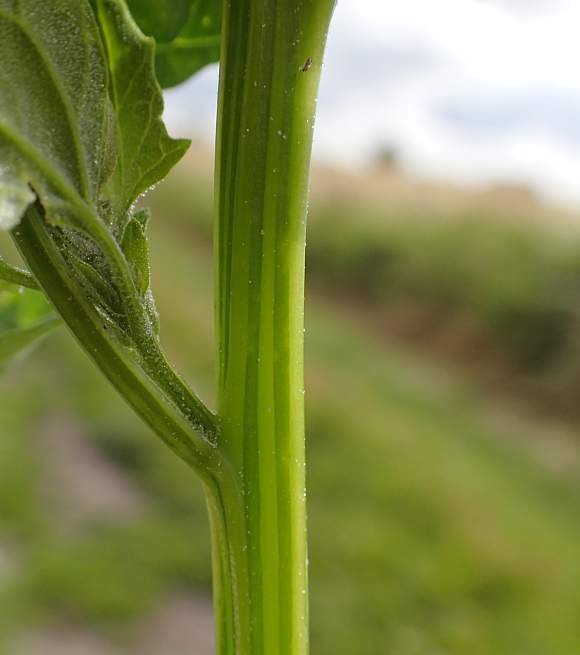 Leaf shape is very variable, but wider with fewer lobes near the foot and narrower with sharper teeth at the top. 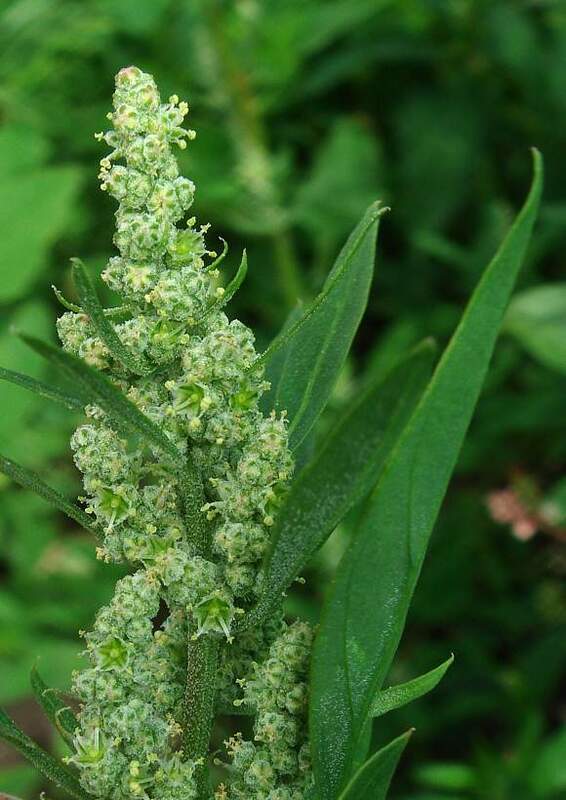 The plant can be covered in tiny white spheres, especially on the obverse of the leaves and particularly the flowers, which are in a clustered spike at the top of each branch. 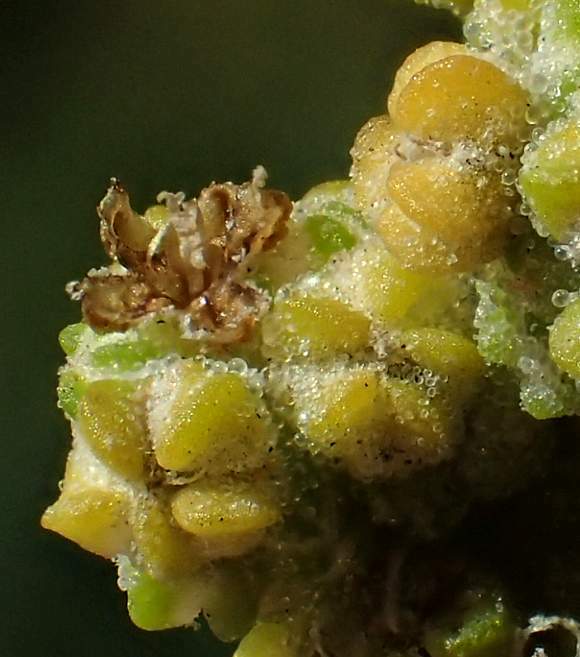 Numerous tiny white spheres on rear of leaves. Upper leaves narrow, lanceolate with forwardly-directed teeth (but these characteristics can vary - they can be oval, or diamond shaped, shallowly lobed, or variably toothed). A baby plant. 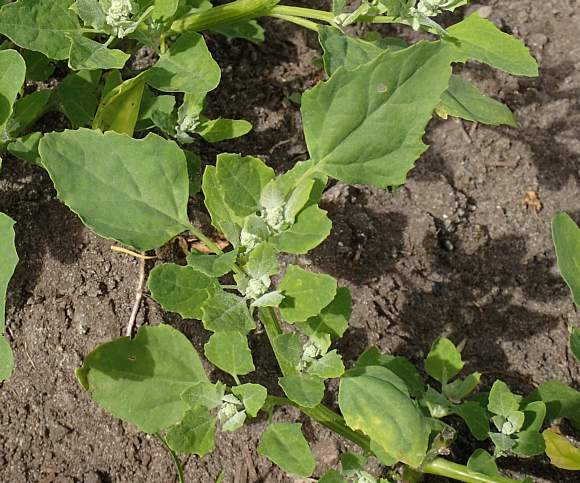 Leaves near the ground wider with less pronounced teeth/lobes. 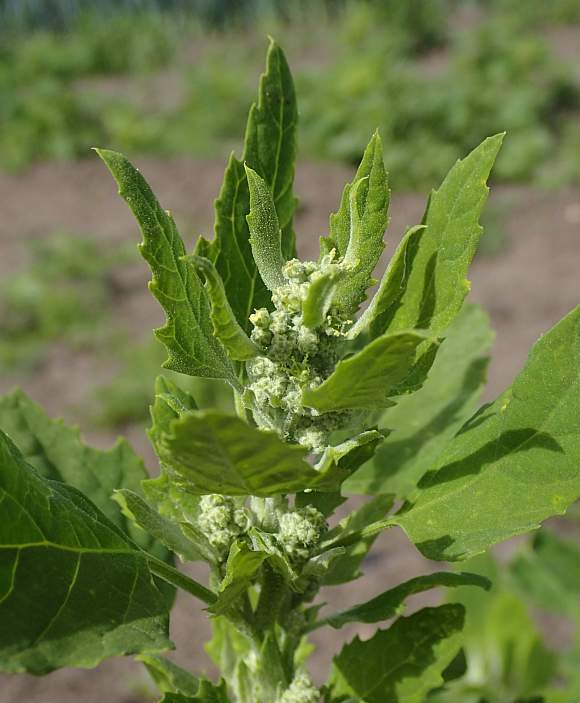 Unlike Good King Henry, the leaves are not arrow-head shaped with the base at 180°, but rather at an angle of about 120°. Bigger baby, leaves nearer top narrower with more pronounced teeth. Leaf size very variable. Some have winged stalks. 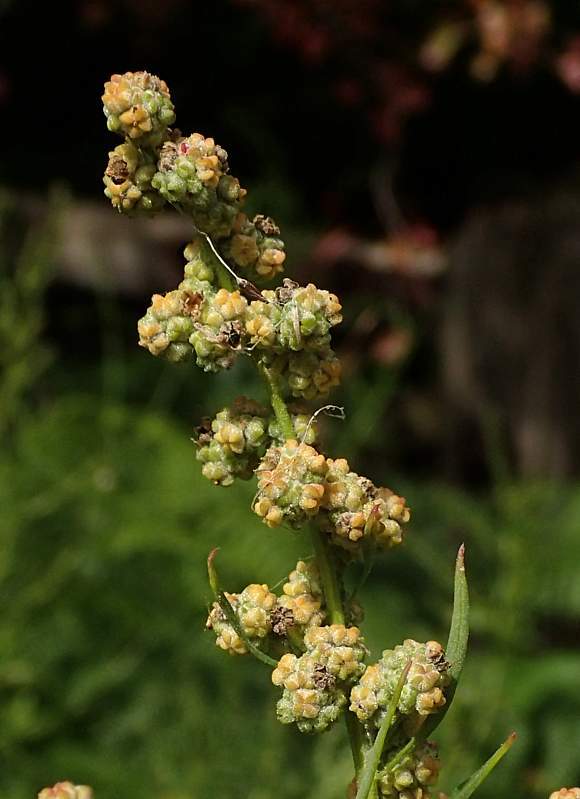 The opened flowers are very symmetrical here with anthers outstretched into the 5 corners of the sepal tubes. Flowers closed like tiny 5-lobed buttons at first and covered in tiny white spheres. 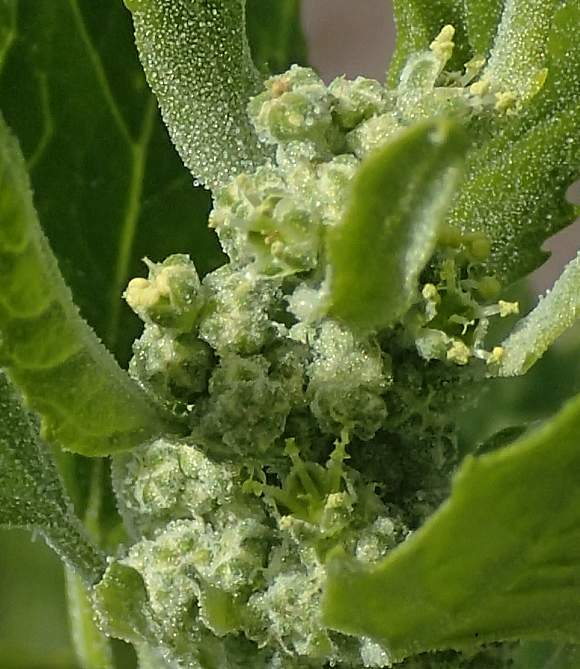 When they open they stick out 5 stamens with tiny cream-coloured anthers. Small cream-coloured anthers on white filaments splaying out into the 5 corners of the sepal tubes. 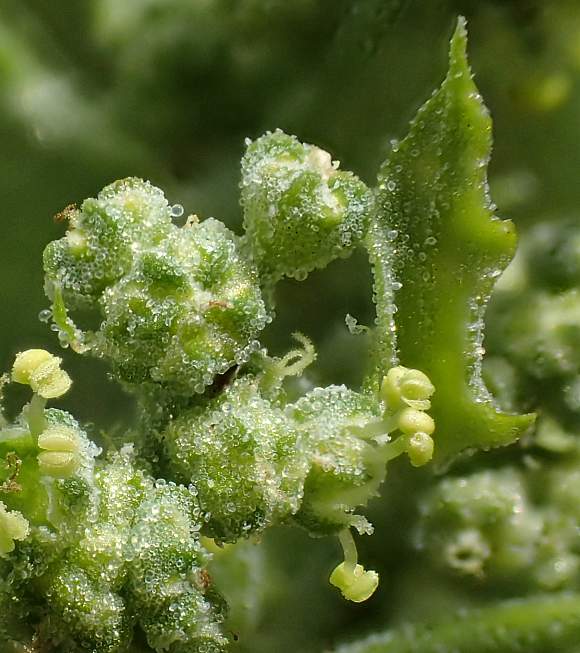 A tri-forked stigma is visible in the centre of the photo, and several opened anthers elsewhere. 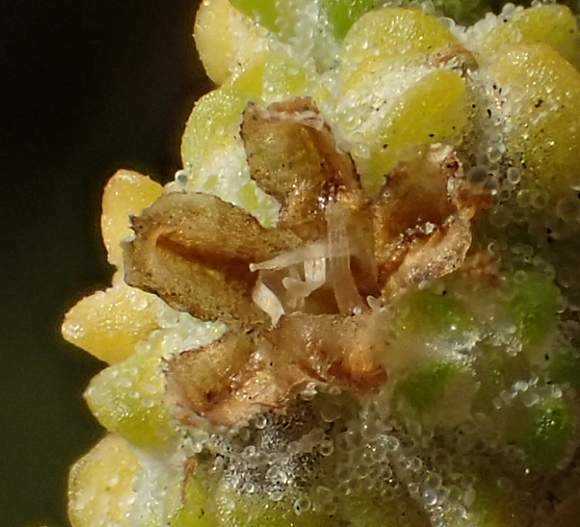 Detail of opened anthers and tiny white/clear spheres. Backs of leaves with ribbed veins and covered in white spheres. Un-opened flowers like the fruits of Common Mallow but with only 5 lobes. Narrow sepal teeth clasp around them. Sten may be ribbed or radially furrowed or reticulately furrowed (var. reticulatum) and washed with reddish-purple especially at leaf junctions. Only faint reddening here on leaf. 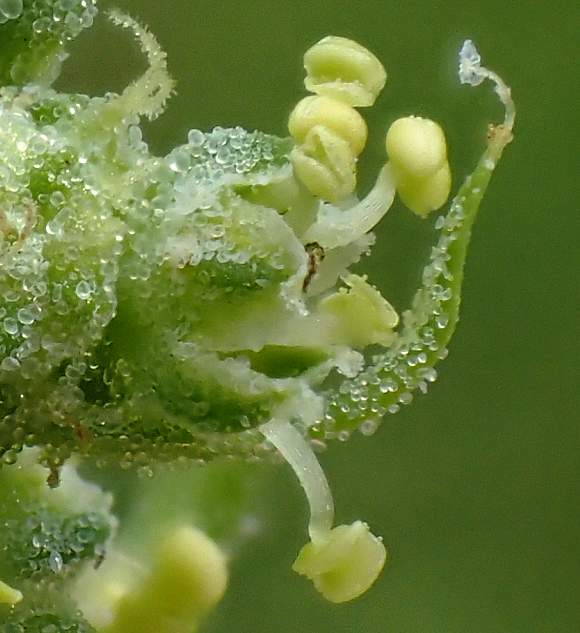 Sometimes the tiny flowers spiral around the stems like DNA. Un-opened flowers have pentagonal symmetry. There is also a spent open flower amongst them. 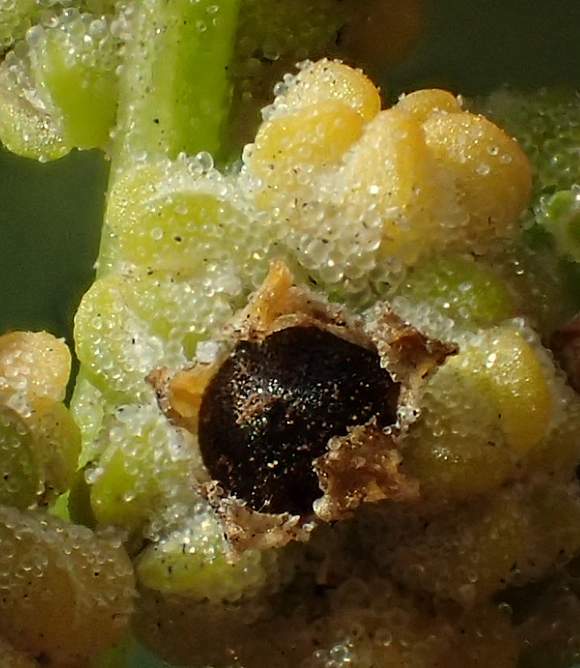 Spent flower and fruit within which contains the seeds. 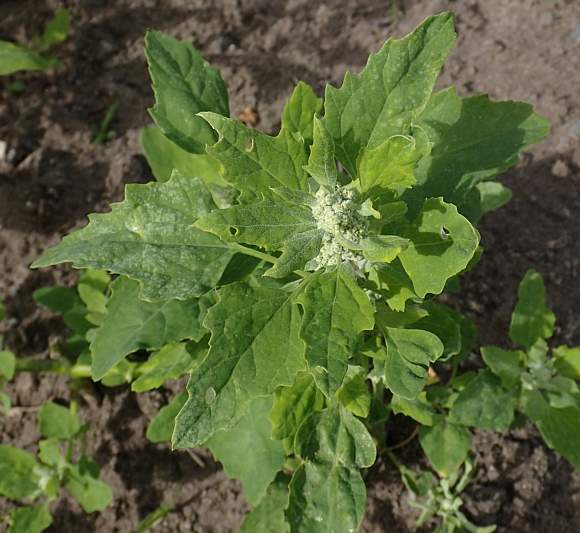 Not to be semantically confused with : Henbane (Hyoscyamus niger) [a very poisonous plant with similar name] nor with Henbit Dead-Nettle (Lamium Amplexicaule) a dead-nettle. 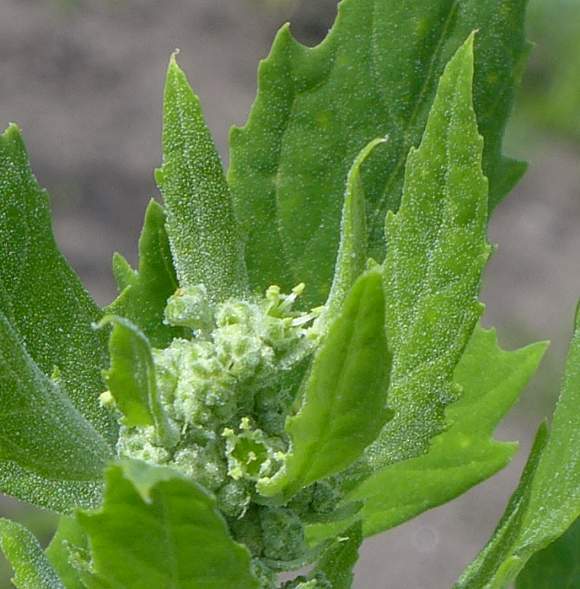 Easily mistaken for : other Amaranthaceae such as Good-King-Henry (Chenopodium bonus-henricus) but that is shorter with arrow-head shaped leaves, Many-seeded Goosefoot (Chenopodium polyspermum) but that has more-or-less un-toothed long oval leaves and is usually prostrate, etc. 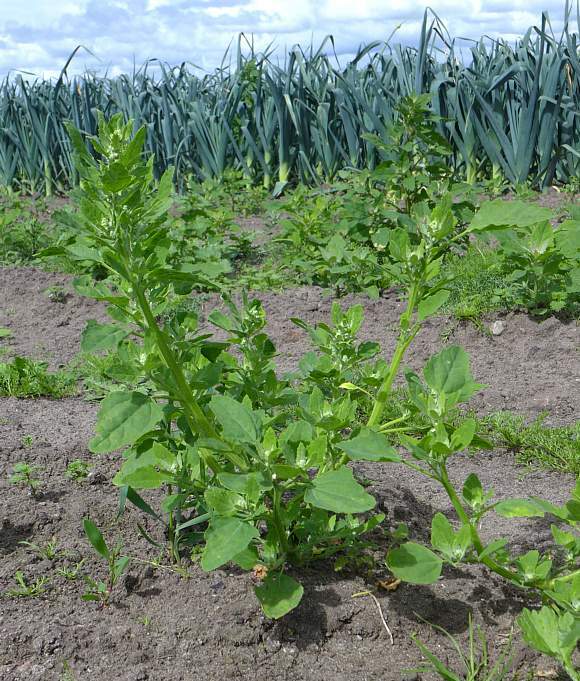 In the olden days this plant was widely eaten as a vegetable, which is why it exists as a relic crop persistently coming up in the margins of arable fields and other disturbed ground which are rich in nitrogen. It does not like much competition from other plants. 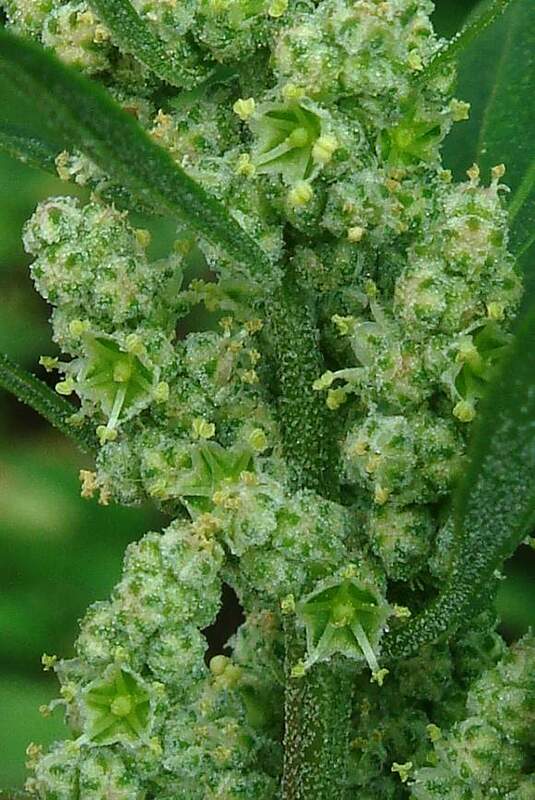 After flowering it falls over with over-bearing weight of foliage. 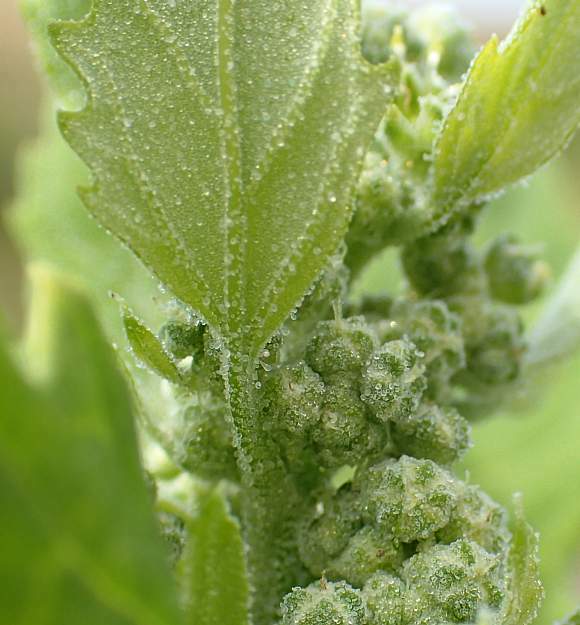 The tiny clear / white spheres may help protect it from rain, for the plant is un-wettable.